Seduction by a master artisan is achieved by the deft handling of his medium, the uncanny finesse of the hand in endowing plastic material with irresistible form — and in the case of “After Industry,” the current offering of Wasserman Projects, the seduction is complete. We are at the mercy of three tantalizing maestros of composition. Each of these artists — Italian sculptor Willy Verginer, Norwegian painter Christer Karlstad, and Michigan-based photographer Jason DeMarte — has such command of his medium that the discursive process of understanding the work becomes secondary. We are awestruck (undressed as it were) by the artistic accomplishment before we understand it, and with each artist the process of understanding requires a traditional method of unraveling and interpretation. Willy Verginer is a woodcarver from Val Gardena, a town in the Dolomite Mountains of Northern Italy known for its woodcarvings of the saints and their stories in Catholic theology. Catholic churches throughout the world have for hundreds of years displayed dramatic woodcarvings of the saints in sculptural vignettes fashioned by the wood carvers of Val Gardena. Verginer apparently learned his craft well there. 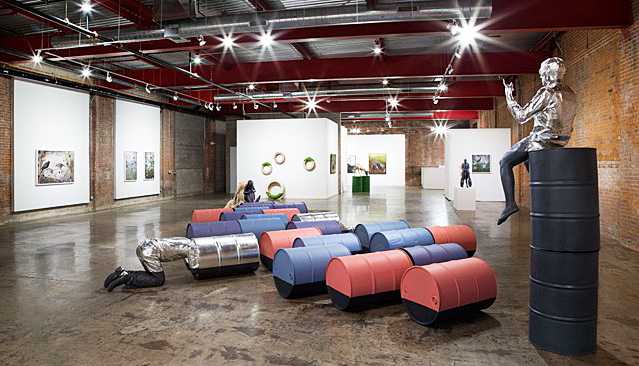 Enigmatically arranged throughout Wasserman Projects’ main space are a dozen figures and objects, carved in lindenwood by Verginer, interspersed with a couple of dozen, color-coded, fifty-gallon industrial barrels. The barrels, and four of the carved figures compose a large installation, including two adult males crawling into barrels, two boys earnestly chewing or biting a donkey, and an adult male figure sitting atop two stacked barrels and gesticulating as if directing the ensemble or preaching. The color-coded barrels, habitual symbols of industrial pollution, create a minimal, contextualizing stage for the vignette. 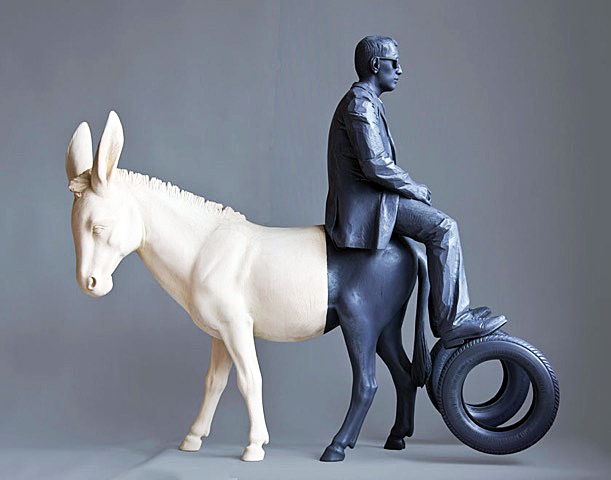 Two other independent sculptures feature a man in suit, tie and glasses, with tires attached to his feet, seeming to ride the donkey backwards and the other is of a grazing deer atop two green barrels with a miniature pine forest emerging from its humped back. The surreal ensemble is at first incomprehensible, but the carved figures are stunningly realistic, producing the kind of awe that one experiences with classical sculpture or religious icons. Lindenwood has a smooth and clear grain, like Grecian white marble, such that each figure is imbued with a glowing, classical sculpture presence. The simply arranged tableau suggests a Biblical allegory (donkey being Christian symbol of hardwork and intelligence), with the human figures enmeshed in a parasitic relationship with industry and nature. Four elegantly carved representations of tires, emblazoned with brand words Goodyear, Detroit, Wasserman Projects, and General Motors, affirm an industrial reading of the allegory. Overall, a toxic, imbalanced interdependence between man, nature, and industry is symbolized in Verginer’s landscape of figures. And like a carving of the Christian narrative of a suffering Christ on the cross, there is a strange irony in celebrating, through a gorgeously carved and composed tableau, the story of the fall of both man and nature through industrial consumption. Like entering a cathedral filled with Christian iconography, experiencing Verginer’s landscape might require a kind of a catechized literacy, a “Sunday School” notion of fall and redemption, to fully appreciate the lineage of his art. For his uncanny paintings, the Norwegian painter Christer Karlstad has composed a pitch- perfect northern landscape and ethereal atmospheric backdrop. Featuring totally benign and dependent human forms entwined with beneficent but wild northern animals, Karlstad’s paintings, staged in these palpably painted Norwegian woods, are like brief parables rather than literary narratives. Each painting sees a human figure contained and cared for in a kind of graceful protection by these animals of the north. 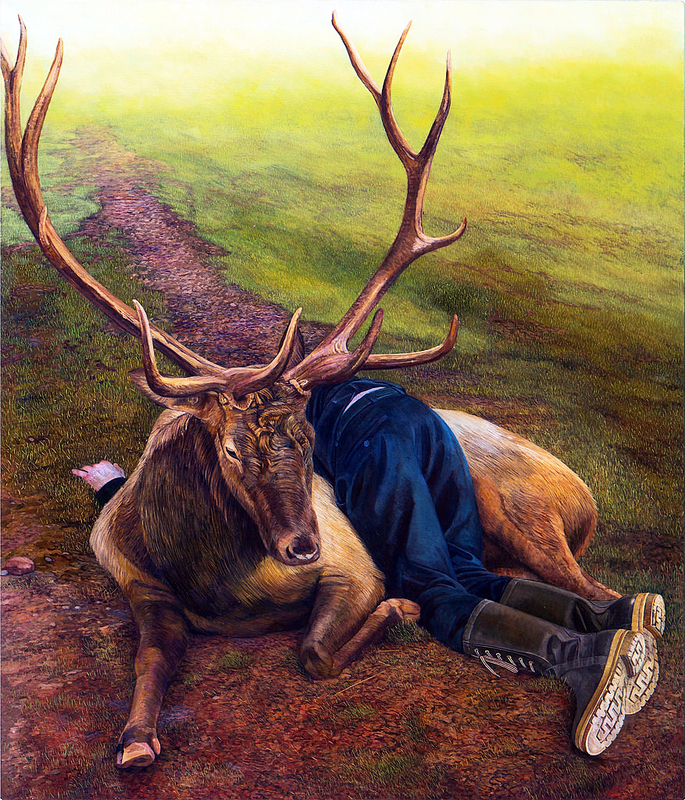 The “attitude” of the enormous elk in “Psychopomp,” as it supports a seemingly repentant young man draped over it, is touchingly docile. The face of the elk in the toxic environment of “Sulphur,” again supporting a draped but seemingly yielding young man, is watchful, protective and spiritually transportive. The precision of characterizing the landscape and the articulation of human and animal forms suggest the profundity and emotional depth of the great German Renaissance painter Albrecht Durer’s art. Like Verginer, Karlstad requires a kind of spiritual, if not Christian, vocabulary for the viewer to gain traction in understanding these paintings, otherwise one might slip into a mocking irony. His human figures seek redemption through engagement with nature, and in each composition, the wild animal is a comforting, healing force. Both artists suggest an emotional abyss between human existence and nature, and both seek a solution to breach that abyss. Verginer’s abyss is shrouded in a symbolic, industrial gloom, and his human figures seem to surrealistically, abjectly grovel before, or seek control, either of nature or the industrial landscape. Jason DeMarte, Pokeberry Persuasion on “Lickerish(Wallpaper)” Archival ink print on digital print. The third artist in the “After Industry” exhibition, Detroit photographer Jason DeMarte, challenges our comprehension of the photographic medium itself and (in keeping with the curatorial theme of man’s relationship with and intervention in nature) of the representation of nature as well. 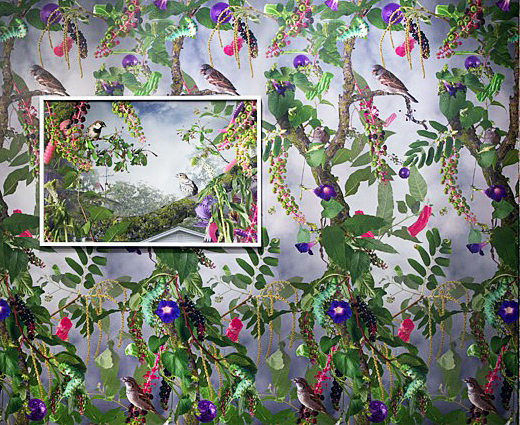 In a selection of five photographs and a mural, DeMarte constructs hyperreal photo-landscapes of climbing vines, flowers, birds and trees that transform nature into a bizarre, ornamental confection and a parody of human spiritual imbalance and perception. DeMarte’s digitally enhanced, diorama-like images, symbolic of our synthetic consciousness, are not only garishly ornamental, but are embellished with colorful jellybeans, candy canes and cake sprinkles, as if nature needed a makeover. “Candied Cultivation,” 2015, is a stunning evocation of this surrealized notion. 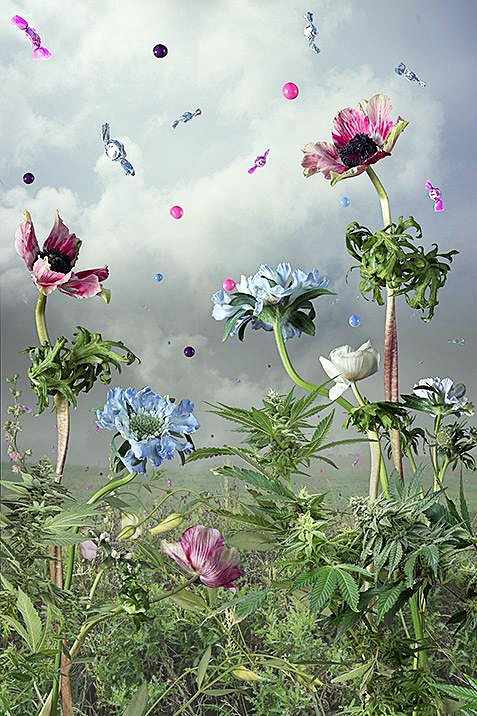 Jason DeMarte, Candied Cultivation, Archival ink print on digital print. Wasserman Projects’ director Alison Wong has put together an exhibition, that in its use of historical forms (such as classical iconography in Verginer’s vignettes, Karlstad’s narrative parables, as well as Demarte’s over-the-top, diorama-like photographs) challenges prevailing minimal or expressionistic artistic strategies, as well as our relationship with social and political landscape. 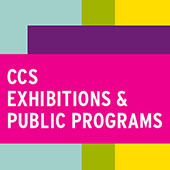 Each of the artists operates at an unusually high level of traditional craft and technique, while pushing the envelope to bring these classical forms to explore contemporary consciousness in a post-industrial landscape.